After their heartbreaking season ending loss to the Green Bay Packers at home, the Chicago Bears had many contracts that needed to be discussed. But the contract (and possible franchise tag) receiving the most attention and concern was that of quarterback Jay Cutler. His stat line this season was not impressive; he was injured for a large amount of time as well, and this had fans on edge going into the offseason. General Manager Phil Emery and Cutler’s agent, Bus Cook, finally came to a conclusion today for the Bears quarterback: a 7-year contract worth $126 million. That averages out to about $17.6 million per year and includes $50 million in guaranteed money. Immediately after the announcement critics came roaring in through social media. Many Chicago fans on Twitter went so far as discussing abandoning the team, saying that the new deal is “not meant for a mediocre quarterback.” The deal was necessary; however, it did not need to be for seven years or for that much money. Though Emery had something to say to the critics, “He’s a demonstrated winner with the Chicago Bears. He can be a key player in terms of being the reason you win.” He does have a point. Sure, Cutler’s season stat line was not stellar (19 touchdowns, 12 interceptions, 2,621 yards), but his 89.2 QB rating was good for 11th in the league. He has one of the strongest arms in the league as well and for the first time in his career has a decent receiving corps in front of him. Many fans and some analysts do not realize that Cutler, statistically, is one of the best Bears quarterbacks in franchise history. Since being traded to Chicago from Denver in 2009 Cutler has thrown 101 TDs to 75 INTs over a span of five seasons, good for an 83.1 passer rating.The six quarterbacks in the five years prior to Cutler? 82 TDs to 88 INTs and an average 69.7 passer rating, according to Bears analyst Zach Zaidman. Even back in the glorious 1985 season, quarterback Jim McMahon did not have the type of line Cutler puts up in a down year: 15 touchdowns, 11 interceptions, for 2,392 yards which carries a passer rating of 82.6. Any critics blaming Cutler and the offense for the .500 season the Bears had this year are completely off base. The defense is what cost the Bears a chance at the playoffs and a winning season, not Jay Cutler. The once vaunted Chicago defense allowed just over 233 yards passing, 161 yards rushing, and four touchdowns per game. Those 161 yards allowed on the ground per game was good enough for worst in the league. Everyone has heard the term, “Defense wins championships.” That statement exists for a reason. An offense can only do so much within a 60 minute football game. The offense in Chicago this season performed exceptionally better than what the league had seen in previous seasons under former head coach Lovie Smith. The Bears finally have a decent quarterback, a very good receiving corps, a pass catching tight end, and an excellent running back. The Bears also have an offensive line that can protect the quarterback and give him enough time in the pocket to survey the field. It is not Cutler and the offense that needs to catch up with the defense anymore, and critics of the Bears quarterback need to understand and accept this. The 2013 season may have just come to a close in Chicago, but look for 2014 to be determined not just by continued offensive success, but by rediscovering defensive success and by recovering their lost pride. The Cutler contract was necessary for Chicago so they could build around him and give him what he needs to perform at the level demanded by ownership and the fan base. 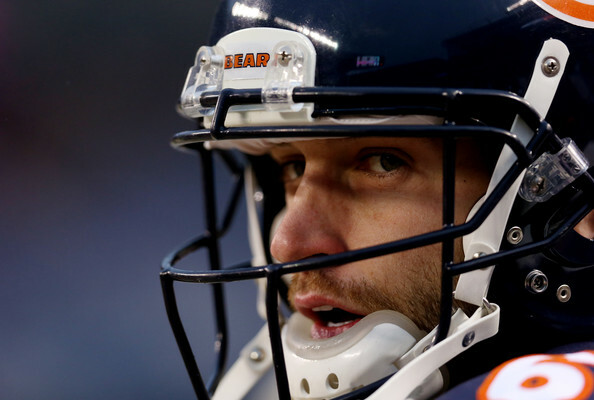 Look for Jay Cutler to prove himself and his worth next season which should be one of his finest as a Chicago Bear. We finally have our quarterback, it’s time to embrace him.